I'll begin this review with a story. 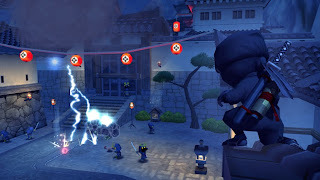 The first time I had a chance to sit down and dig into IO Interactive's latest title, Mini Ninjas, was when we had company over. I was hot on the heels of finishing WET, but due to the age of said company, I didn't feel that "running around, duel-wielding death blows and doling out carnage" to be of a tactful decision. After a few hours of play, the 7-year old I was sharing game-time with, turns to his mother to describe the gameplay. 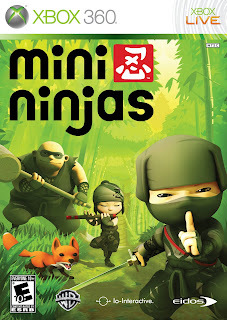 "Mom, this game isn't like 'real' killing, you see, the evil bad-guy turned all the rabbits, frogs and bears into evil ninjas. So when you 'kill' them, they just turn back into an animal." 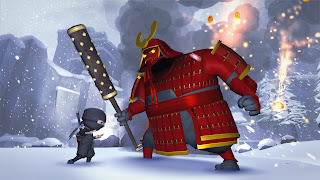 So there it is, a kid-friendly ninja game. Taking a complete 180 from their previous efforts (the Hitman series), IO Interactive has crafted a genuinely entertaining, if not formulaic, hack 'n slash. The color palette and art direction was lifted directly from The Wind Waker's crib notes, and the difficulty and accessibility of the game is along the lines of a LEGO title. Kid-Friendly. 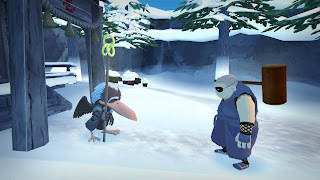 You begin the game in control of Hiro, after an initial "training" session, you and your best friend, Futo, set off on a journey, one that the other ninja's in town have not returned from. 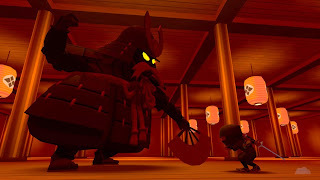 Your Master sends you along to stop the "Evil Samurai Warlord" and along your way you wind up finding your old friends. As you progress, they are added to your party, and you can swap out to be any of them to use their unique skills. Fighting is handled well, with a mix of hand-to-hand, throwing stars, bombs, and Kuji magic. You use a variety of these tools to take town your enemies. Though you have a lot of options, you'll likely just use a handful of skills. But don't forget to explore your surroundings, you'll find hidden shrines that house magic scrolls to increase your magic repertoire. In keeping with the developer's goals of making this game very family-friendly, you can even skip fighting altogether, and sneak through the grass. There will be areas you need to battle, but you can sneak through in true ninja-like fashion. Wait, they were going for authenticity here. Overall you will find a lot to like here, a quick pick-up-and-play title that will net you a standard 8-10 hour play-through, but then you'll probably never play again, as their is no multiplayer, and unless you ARE a little kid, you probably find little reason to play through it again. Mashbuttons gives Mini Ninjas a 7.5 out of 10.